SlingBag™ patented system is designed to move and place burlap bags for use in underwater pipe stabilization, protection and separation applications. Its use is over 5 times faster and safer than conventional methods – every time! SlingBag™ is safe, and has been proven to be the most economical method of underwater burlap bag placement. Woven polypropylene fabric SlingBag™ with four 24” polyester lifting loops. Holds fifty-six (56) - 60 lb. burlap bags. 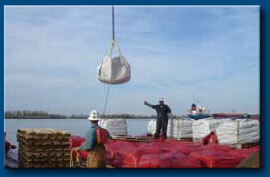 SlingBag™ can be lifted with a single point pick up and lowered into water or onto a land job site. 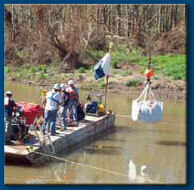 The SlingBag™ has been used in applications in excess of 8,000 feet water depth. SlingBag™ can be placed and released with a Remote Offshore Vehicle (ROV) by simply unhooking any two lifting loops in a row. Up to 5 times faster & safer than conventional/individual bag placement – ever time! The released burlap bags create a bonded support pyramid for a pipeline. Full SlingBags™ can be left underwater as supports allowing easy access to valves, pipelines or other protected structures. * Includes SlingBag™ with 56 burlap bags, pallet and export wrap. Patented design allows for ease of shipping and loading on and off shore. 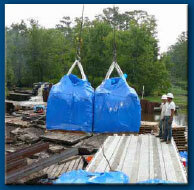 SlingBags™ can be off-loaded with a crane or standard forklift. 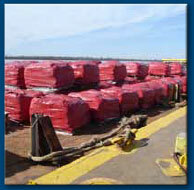 SlingBag™ pallets are shipped with a weather resistant pallet cover and can be double stacked on offshore vessels. SlingBag™ is ideal for inshore or offshore pipeline projects.